Babies Are Simple: To the Carnival! 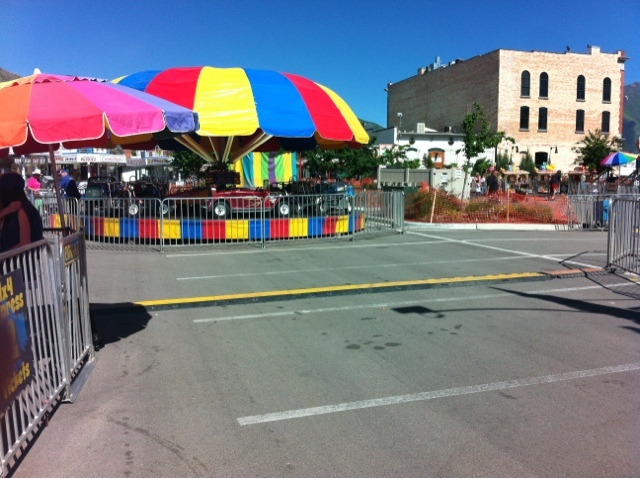 Nathan and I decided we wanted to check out the carnival on Main Street that was part of the Art City Days Festival. After going to the child's carnival, Fun-A-Rama, I was pretty disappointed with the larger carnival--mostly due to the price. The rides were, on average, three dollars each. With that in mind, Eliza only went on four different ride (which I felt was very generous!). I don't regret spending the money, though, because Eliza really had a great time. There weren't any lines, so Eliza got to ride all of the rides for at least 5 minutes. Seriously, though. We were the only people there. She was actually begging to get off of the spaceship ride (she was the only one on it, so the lady let her stay on forever). She also rode on her first rollercoaster and was screaming with happiness. She loved it! She's definitely my child. After the rides, we walked down the street to an old pharmacy that also serves ice cream. It reminded me of It's a Wonderful Life, and I immediately loved it! Our friends promised we would adore the place, and they were right. Kyle recommended that we try the root beer, so Nathan and the twins shared an enormous float. The babies couldn't get enough! They were pretty exhausted and hot from being outside, so they definitely got a good serving of ice cream. Eliza got some strawberry ice cream and enjoyed eating her cone while sitting on a barstool. I got burnt after being outside for 45 minutes, so I wasn't in the mood for ice cream. Regardless of the burn, I still had a great time. Family days are the best. When we come to Springville next, I definitely want to go to the soda shoppe! It looks so good.